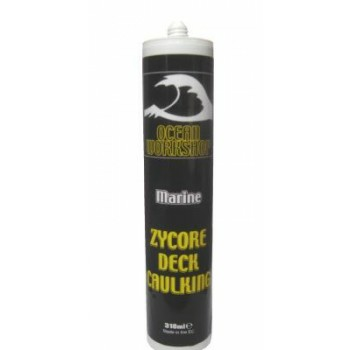 Zycore Deck Caulking is a high performance deck caulking based on hybrid SMP (Sily Modified Polymer) technology. This means it is easy to apply and clean up and importantly is safe to use as it contains no isocyanates or solvents found in conventional polyurethane deck caulks. It has excellent weathering durability and will not yellow and sands to a perfect finish. Compatible with most teak decks. Ensure the surface is clean, dry and grease free. Prepare new or oily timber by wiping with acetone and prime as required. Use bond breaking tape at the base of the seam where required. Apply to the seam, overfilling slightly to allow for sanding. Allow to cure and depending on temperature, after 4 to 6 days, sand along the seam - never sand across the seam.